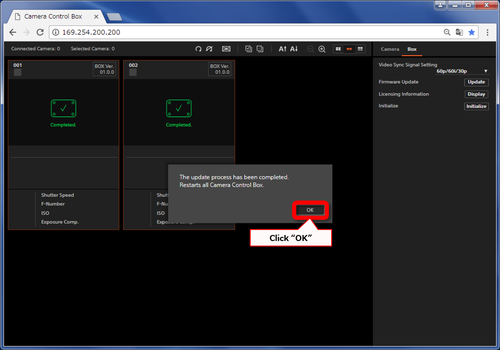 NOTE: This updated camera control box can be used with DSC-RX0, version 3.00 or later. Refer to the Help Guide for updated function usage. Connect the USB cable from the computer to camera control box (CCB-WD1). NOTE: Check to see if the update is necessary. The file [Update_CCBWD1V0200.zip] file will start downloading. NOTE: For Windows 8.1/10 users, with the standard settings of Internet Explorer, the update file will be saved in your Downloads folder. Click the Desktop tile from the Start screen and find the downloaded file in the Downloads folder by using Explorer. Connect your computer and camera control box with a LAN cable. NOTE: Even if camera is not connected, update is possible. 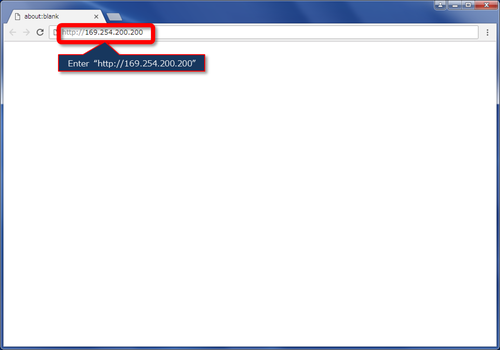 Start a Web browser on the computer and enter the address http://169.254.200.200. 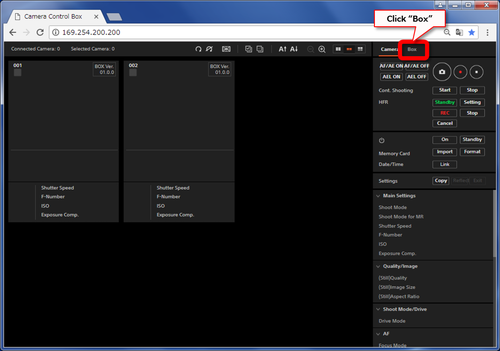 Click the [Box] tab in the displayed Web browser. 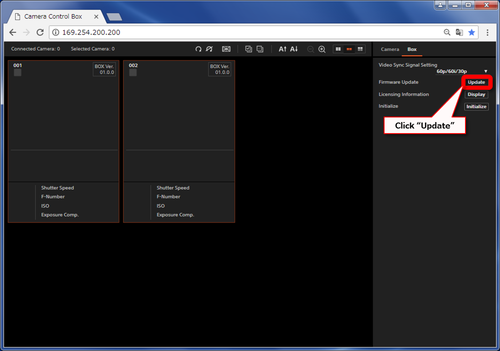 When the confirmation message dialog is displayed, click the [OK] button on the dialog. 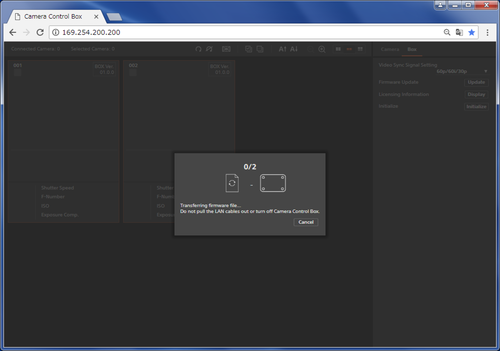 NOTE: To cancel the update, please click the [Cancel] button on the dialog. 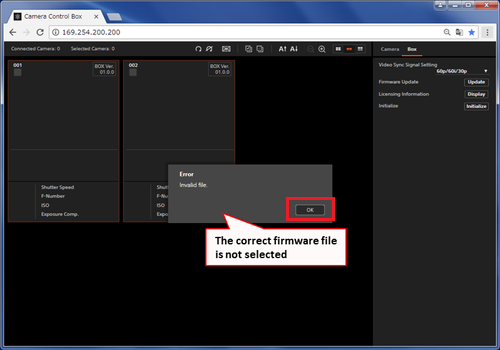 Select the firmware downloaded in advance from the file reference dialog. NOTE: To cancel user update, please click [Cancel] button. 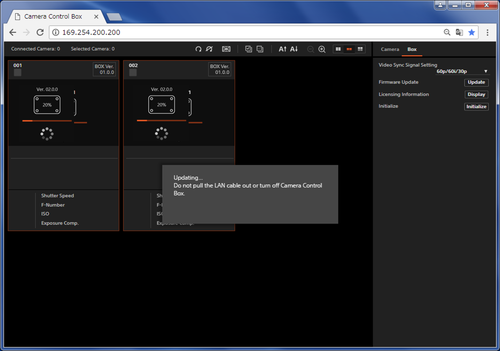 Transfer the update file to the camera control box. A message is displayed during file transfer and the firmware is transferred to the camera control box. 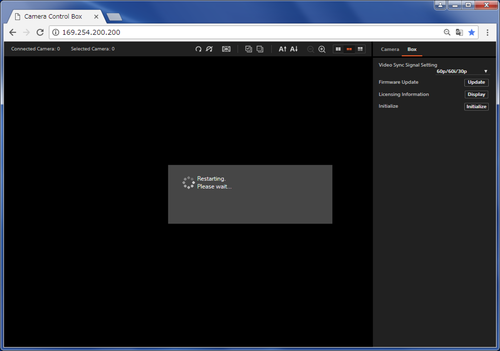 To cancel update, please click [Cancel] button on the dialog. Do not pull the LAN cables out or turn off the camera control box while it is running. It may cause a failure of this product. 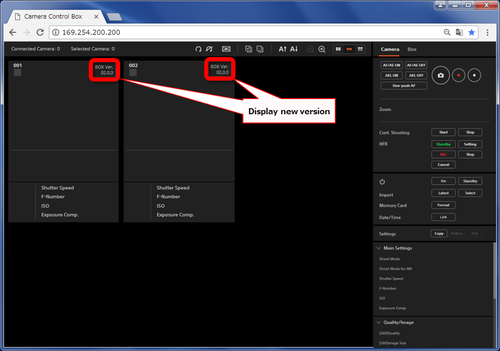 A message is displayed stating that the device is being updated, and the update will start. NOTE: The update will be implemented at the same time when multiple camera control boxes are connected. 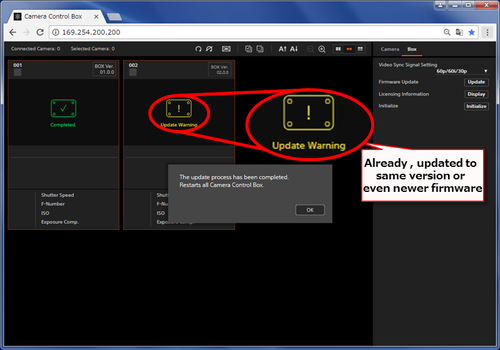 Complete the update and confirm the restart of the camera control box. When the update completion message dialog is displayed, click the [OK] button. Restart the camera control box. A message will be displayed and the camera control box will be restarted. 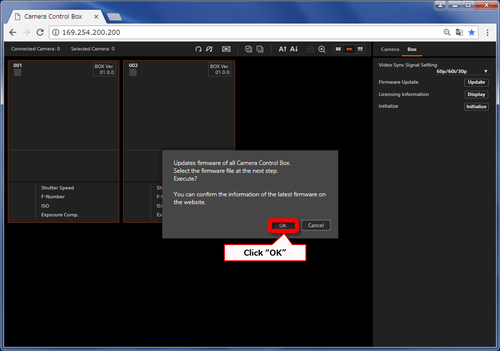 When the camera control box starts up, a new version is displayed in the Web browser, and the update is completed. If the following dialog is displayed when selecting a file, the correct firmware file may not be selected. Click the [OK] button in the dialog. It returns to the "Click the update" procedure screen.Select the correct firmware file and update again. If you see the following display after update execution, the camera control box has already been updated, or the firmware you tried to update may be older. It may happen if versions are mixed, such as when updating some camera control boxes in advance. The camera control box with the above is not updated in this update. 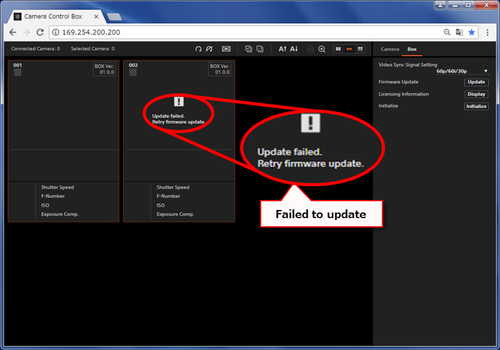 If you need to update, check the firmware version again. If you see the following display when the camera control box is powered on (including reboot), the updating may have failed, such as when the camera control box was powered off during the update.